Mourners endured wind-driven snow and biting rain, forming a column of umbrellas and plastic ponchos that stretched over cobblestones and past deep puddles. They dressed in dark suits and black dresses, soggy blue jeans and Patriots jerseys. Some leaned on canes. Others clutched American flags, carried bouquets of white lilies, and brought photographs of themselves with the former mayor, Thomas M. Menino, who died Thursday. “I just wanted to say goodbye,” said Marilyn Marion, who came from Roxbury with her 5-year-old godson because she wanted the boy to know the goodness of the mayor. The crowd embodied the diversity of Boston: Vietnamese from Fields Corner, Italians from East Boston, African-Americans from Hyde Park. They were gay and straight; able-bodied and disabled; wealthy and poor. 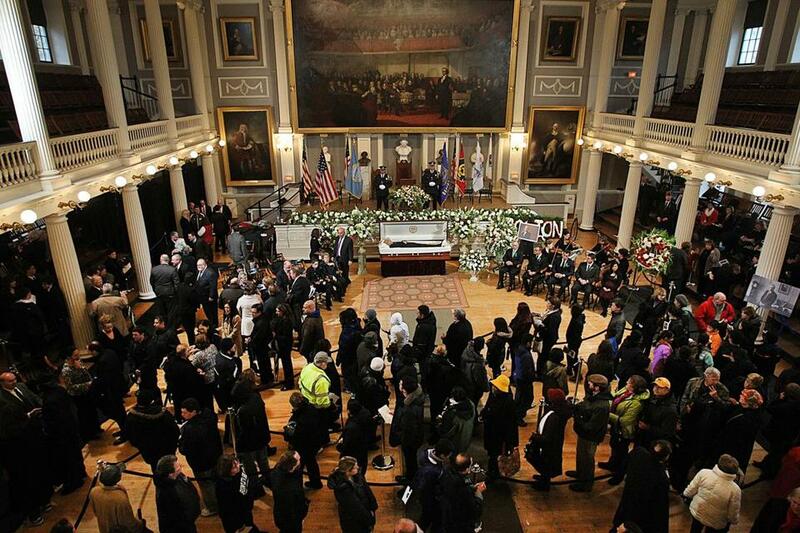 Mourners and family members attended a wake for Thomas Menino at Faneuil Hall Sunday. As a string quartet performed somberly, the multitude climbed stairs into the Great Hall. Honor guards stood watch on a stage bursting with hydrangeas, white and pink roses, and calla lilies. 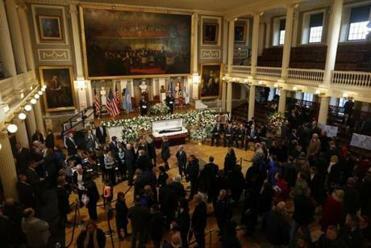 Menino lay in an open, mahogany-colored coffin embossed with the seal of the City of Boston. Black rosary beads were laced through his fingers. Next to the mayor rested his distinctive cane made from a baseball bat. “He’s gone,’’ said Karen Gardner, who came from the Fenway and choked back tears. Boston’s new mayor, Martin J. Walsh, led a large contingent of elected officials in a procession across the street from City Hall. Walsh approached the coffin with his mother and his longtime girlfriend, Lorrie Higgins. They made the sign of the cross and bowed their heads in silent prayer. Governor Deval Patrick lingered for several moments at the casket. He cocked his head and looked at Menino, almost as if he were in conversation. Mourners waited to pay respects to Menino. The mayor’s wife of 48 years, Angela Menino, stood at the head of the receiving line. She grasped both hands of House Speaker Robert A. DeLeo. She walked Secretary of State John F. Kerry to the casket and stood with the former US senator from Massachusetts as he genuflected and made the sign of the cross. When former mayor Raymond L. Flynn approached, Angela Menino threw open her arms. “Ray,” she said, enveloping her husband’s predecessor in a hug. Kathryn White, the widow of former Boston mayor Kevin H. White, passed through the line in a wheelchair. She stood when she reached Angela Menino. They embraced. In the long reach of Boston’s history, few have lain in state at Faneuil Hall, a Colonial-era treasure nicknamed the “Cradle of Liberty.” Other honorees have included the building’s namesake, Peter Faneuil, and Boston Massacre victims Crispus Attucks and James Caldwell. The last to lie in state was the abolitionist and orator Wendell Phillips in 1884, according to the city. Menino delivered his first inaugural address in the stately red-brick edifice. His City Hall office looked down upon it for the next 20 years. Menino died of cancer 10 months after walking out of City Hall. In the last century, no Boston mayor passed so soon after leaving office. Menino’s wake Sunday rivaled that of the irrepressible James Michael Curley, the former governor and four-term mayor who drew thousands to the State House when he lay in state in the Hall of Flags in 1958. A private funeral Mass for Menino will be said Monday at Most Precious Blood Church, where he was baptized and served as an altar boy. A procession to the church will wind through the city, passing places of significance to Menino as he makes his final journey home to Hyde Park. On Sunday, mourners began lining up before 8 a.m. They included lawyers, janitors, building inspectors, police officers, and devoted political volunteers such as Ross Levanto, who wore a green Mayor Menino campaign button. They kept coming until about 8 p.m., when the viewing ended. Among the last mourners to trickle out was Christine Ordija, who emerged alone, wiping tears from her eyes. “I really did love the guy,” she said. Ordija moved to Boston in 1996 for school, she said, so Menino was mayor for her entire adult life. She spoke to him last year, she said, and he talked about his decision after the Marathon bombings to leave the hospital against doctors’ orders. “People kept asking him, ‘What does it mean to be the leader?’ And he kept saying, ‘You’ve got to have heart,’ ” she said. 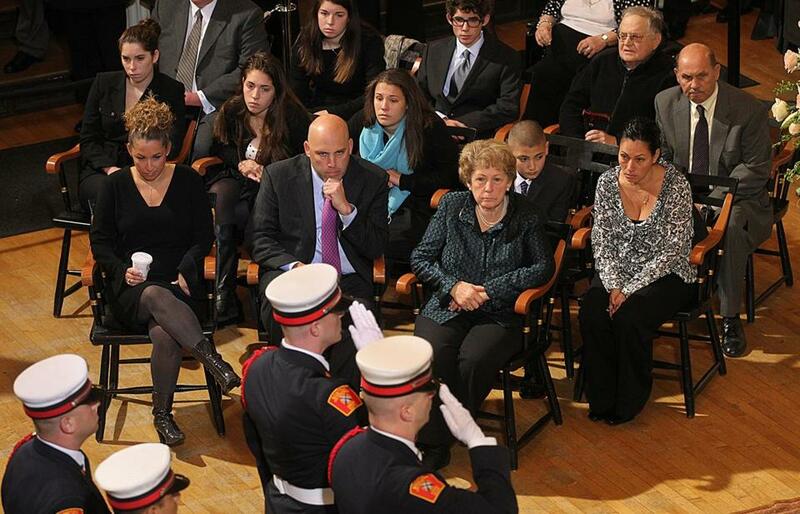 Menino’s wife, Angela, two children, and six grandchildren watched as the wake began. As they waited earlier in the day, people pulled out cellphones to display pictures with Menino. One held a sign that read, “Gracias Menino!” Others shared stories about their connections to Boston’s longest-serving mayor. Michele Davis, principal of the Warren Prescott K-8 School in Charlestown, stood with seven students passing out programs. Davis recounted a Mayor’s Award ceremony for students at Faneuil Hall each year. “I just remember the pride and joy on the mayor’s face as students walked to the stage to get their trophies,” Davis said. Further back in line, Greg Stoddard wore a gray sweat shirt from Camp Harbor View, an island sanctuary founded by Menino where urban youth escape summertime violence. Stoddard is the director of operations there, and he said he last saw the former mayor in August at the end-of-season barbecue. From Dorchester’s growing Vietnamese community, Karen Diep and her neighbors came to thank the Menino family for the man who was among their greatest allies. Diep is the owner of Van Shabu & Bar and Savin Hill Specialties. She said Menino helped her parents and other Vietnamese business owners operate safely on Dorchester Avenue. 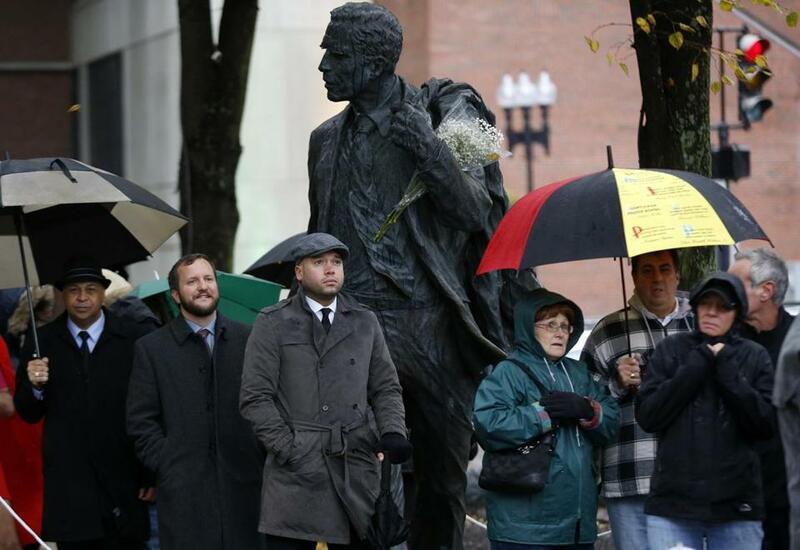 Multitudes turned out to offer their respects to former mayor Thomas M. Menino on Sunday. Teacher Darren T. Wells took the subway from Forest Hills on Sunday. The former mayor may not have known Wells’s name, but he knew he was an educator at the James P. Timilty Middle School in Roxbury. As the day darkened, the long line thinned but people kept coming. Snow fluttered in the air. “I don’t even live in Boston, but he had an impact on my life. He’s forever Boston,’’ said Nekita Lamour of Malden. The flurries were fitting. Evan Allen of the Globe staff contributed to this report. Andrew Ryan can be reached at andrew.ryan@globe.com.